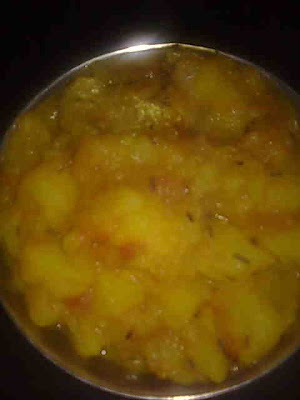 Aloo ki sabzi or aloo bhaji is a staple in many Indian households including mine. I cook potatoes in many different ways, some recipes I have already blogged about and some I will be sharing in future. 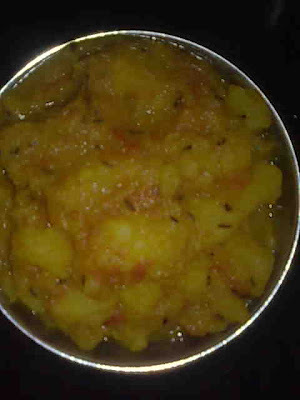 Aloo ki sabzi tastes great with roti, paratha, poori and kachori. Some people even have it with rice. 1. Break aloo with your hands to get uneven pieces. Grind together onion, ginger and garlic. 2. Heat oil in a pan and add cumin seeds. When they change color, add hing. Add onion paste and sauté till it gets light brown. 3. Add tomato puree and all the spices and salt. Fry till oil begins to separate from the masala. 4. Add potato pieces and mix. Add 1 cup water and lower heat. Cook covered for 5-7 minutes. Serve hot aloo ki subzi with poori or paratha.